Before my holiday, I remember trying to research more about the stay in the Andaman’s and could only find the website of three different places on Havelock Island. After visiting, there’s actually plenty more places to stay and so I’ve put together a list of places I found. Note that most of the accommodation tends to be open air huts and many of the places end up having shared bathroom and toilet blocks. Some of the open air huts offer zippered tent covers to keep out insects though many places don’t have that. Here’s the list of places I found following the main road from the jetty and Beach No. 2 to Beach No. 5. The contact numbers should be correct, at least at the time of this writing (based on the pictures of the signs I took). Happy Resort – A collection of eco huts by the beach with a little restaurant offering beer. Sea Shells – A new development owned by the same people who run the Silver Sand, I ended up staying in these self contained huts made of concrete and wood. At the time I stayed, it didn’t have hot water in the bathroom though it was a very new place. Eco Villa (+91 3192-282072) – I think this is more of the open air hut style accommodation. I didn’t really venture in, so I can’t really say. 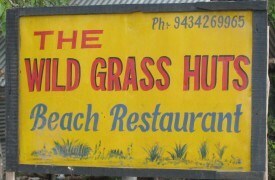 The Wild Grass Huts (+91 9434269965) – As the name mentions, it’s definitely the open air hut style. Once again, another place I hadn’t visited. Amazon Beach Resort (+91 9933294025) – Located down a very rocky road 200 metres off the curve on the main road, this is open air hut style accommodation. Café Del Mar (+91 3192-282343) – Run by the same people as the Barefoot resort on the other side of the island, this is home to the Barefoot Scuba diving school. Once again very much the Bungalow Beach Huts. 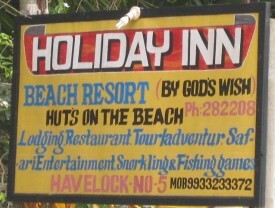 Holiday Inn Beach Resort (03192-282208 or 9933233372) – More open huts by the beach. Pristine Beach Resort (+91 3192-282344) – Offering bamboo cottages and huts by the beach, also has a pretty good restaurant called The Poseidon. Island Vinnie’s (+91 3192-282187)– The home of Dive India, Island Vinnies is run by a guy, unsurprisingly called Vinny. It’s a nice friendly place that I spent a lot of time at because of the open water diving course. Individual huts with zippered closures ensure good night’s rest and they have a communal block of toilets and showers. The owner also has a couple of very big and friendly dogs called Frodo and Sam that enjoy swimming in the water and catching crabs. El Dorado – Didn’t have a contact number and I think it’s just more eco huts by the beach. 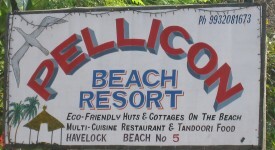 Pelicon Beach Resort (+91 9932081673) – Eco friendly huts and cottages on the beach. Quite a nice restaurant here. Sunrise Beach Resort (+91 3192-282408 or +91 3192-282387) – Nothing to add here as I didn’t visit. 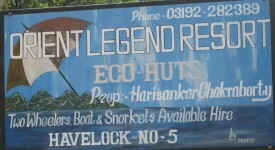 Orient Legend Resort (+91 3192-282389) – More eco huts located on Beach Number 5. The Wild Orchid – I ate here one night (I think unfortunately the only one that gave me food poisoning) though the atmosphere here is very friendly and very enjoyable. The restaurant attracts a big crowd at night. Dolphin Resort – I think this is the government run resort, though they didn’t have a contact number on any signs I could see. A quick search on the web should uncover their number pretty easily. Coconut Grove – Another place I didn’t visit. Emerald Gecko – Apparently run by the same people as the Wild Orchid this places offers bamboo lodges and huts. Their restaurant offers a cut down menu of that offered at the Wild Orchid. Still very nice food though. 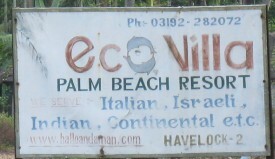 There’s a number of other eco resorts on the way to Beach No. 7, though I didn’t take any pictures of them so I can’t write up about them. The only other resort worth mentioning is the Barefoot resort located on the other side. Most of the people who I talked to staying there were very happy with the services offered there although it’s a bit of a trek (20 minutes by bike) so probably not the most ideal place to stay if you want to go diving every day (since they leave early and from the other side of the island). It’s great if you want to chill and relax on the beach, do some kayaking or hiking. Arun Kumar, my newly found acquaintance at Port Blair recommended this place for me to eat. Located right at the end of the jetty, it’s open around 7pm for dinner and, like most places on Havelock Island, does multi-cuisine – whatever that means. I’ve had great seafood from this place the four times that I’ve been so far. The owner brings out plates of fresh seafood for you to point at and choose how to cook. My first outing saw me greedily pick four large prawns, and when I mean large, imagine about double, almost triple the size of the largest king prawn you’ve seen and you have a good idea about what I’m talking about. Although costing 150 rupees each, they cooked them in some sort of masala salt on a bed of spiced rice, and the usual tomato, cucumber and onion mix. Absolutely delicious. The second time I went, he brought out a plate of two large fish, and then what I thought were even bigger prawns. He called them bay prawns, and later realised they looked like mini lobsters also just as big that a person with large hands could carry only two in one stretched hand at a time. He barbequed these ones this time in a divine spicy tandoor paste, this time only accompanied by the tomato, cucumber and onion mix. I asked for some rice and he also brought a number of the daal and veg curries everyone else seemed to be tucking into. The second time around, I chatted to him briefly about Mr Kumar referring me, joyously laughing at the business card Mr Kumar showed me. At the end of the meal, the manager proudly showed me the homemade BBQ at back. 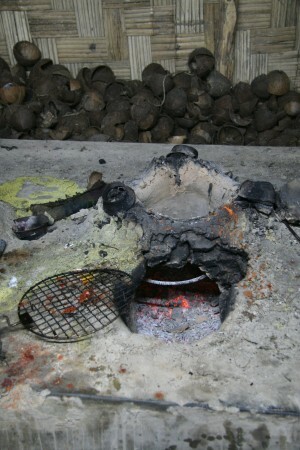 What a pleasure it was to see a kitchen – like rotis being made, a hollowed out concrete block fished with ashes acting as a BBQ and a number of busy staff preparing everyone else’s meal. The most popular meal appears to be the thali served on a large metallic plate with either endless heapings of rice, or a number of rotis ordered on demand. Each table holds a trio of buckets, each filled with a different vegetarian curry – one I could tell was some sort of aloo (potato), another a distinctive daal (lentil) and the other one a very watery curry poured on the rice. Another bucket seemed to float around though I couldn’t work out what it contained. Some parties also ordered a side of fried fish, or some sort of chicken, both arriving on a tiny metal disc. 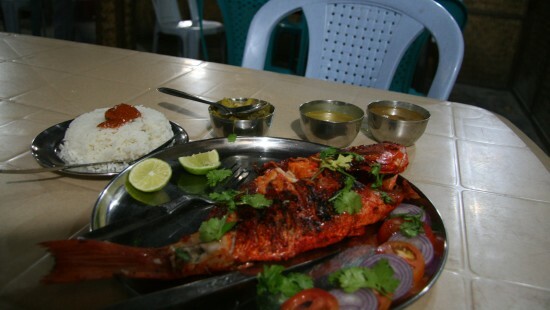 Highlights: Fantastic food that’s popular with the locals. I can’t highly recommend the BBQ (Tandoori) options especially when it comes to seafood such as lobsters or fish (I had both here). The masala salt prawns were absolutely divine and huge! Room for improvement: Expect seating on plastic chairs and tables though they seem clean enough. I’ve finally got through all the emails, uploaded all my holiday snaps and written up enough of my holidays to finally properly retrospect on the year that was 2007. It’s been a busy one and it looks a bit like this. I ended up with plenty to the US for some reason, hitting Philadelphia, New York City, Las Vegas, and Phoenix. The European trips started with a weekend in Paris, followed by an ad hoc whiskey drinking holiday in Scotland covering Aberdeen, Dufftown (in Speyside) and finally Edinburgh. Ben organised for eight of us to go to a wonderful skiing week in Andorra. The weekend after that I returned to Edinburgh to really get a good feel for the city. I ended up in Italy for a work conference visiting Milan, Bergamo and the Como area only to return to Italy shortly after to its Sardinian island, Alghero for a weekend with Kath. My final “European” trip actually ended up in Bath (of all places) for the bank holiday weekend. I started my time in India (only eight months later than originally planned) and I’ve managed to fit in quite a lot of travel since being here. I’ve managed to visit Mysore, Kochi, Savandurga, Pune, Mumbai, Chennai, Mahabalipuram and Kolkata. I also managed to visit a number of India’s famous hill stations including the Queen of them, Ooty, and a couple very close to Pune, Mahabaleshwar and Panchgani. 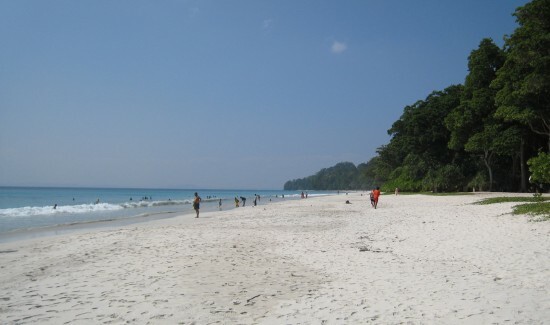 Most recently, I spent the Christmas and New Year period on a secluded island in the Andaman Islands. Things ended up pretty quiet this year for concerts and the small number of people I did see included The Feeling, Bloc Party, The Editors and Keane. I also attended my first two British/European music festivals – Oxegen held at the Punchtown Racecourse just outside Dublin and then Bestival, on the Isle of Wight. Most memorable artists from Oxegen included the ever gushing Snow Patrol, the energetic Calvin Harris and the stunning light and sound extravaganza that is Muse. The Chemical Brothers were easily the musical highlight of Bestival. Musicals and theatre shows this year included The Colour Purple whilst I was still in New York, a disappointingly droll Porgy and Bess, a bright and energetic Lion King, and a very funny show called Boeing, Boeing. The highlight was the marathon yet very succinct Lord of the Rings stage show. I moved for the second time since living in London to Farringdon, very close to Smithfields, Fabric and Turnmills. Fortunately it’s also just down the street of the Scotch Malt Whiskey Society that I became a member of and only a twenty minute walk to Old Street where I started tumbling classes. I trialled vegetarianism for an entire month after coming back from the US, leading to learning more about the whole vegan, vegetarian and pescetarian lifestyles people live. I barracked for Australia while I watched them lose against Denmark in a disappointing football match near White City. I had a go at Bobsledding, of all places, in Bath(!) where they have a training site for the British team. I also split out my life blog from my work blog at last as the content really started diverging and work people weren’t that interested in all the things I got up to, and my friends probably aren’t that concerned about my rants about onboarding and various coaching and development things I do. I’ll be sure to write up a work retrospective on the other blog too if you are interested. I finished the year off by finishing my PADI open water diving qualification on New Year’s Eve in the Andaman Islands. My three months are finally up and I’m flying out tomorrow morning very early to return “home” to the UK. After all my holidays and running training in India, I’m actually looking very forward to getting back into the whole swing of living in London. I’ll be only in London for a short time – I head to New York to have a bit of a family reunion and I’m also looking forward to that. India has been great. I’ve seen loads of places (there’s still so much more to go) and I’ve had a great opportunity to meet and work with plenty of great people. I’m sure I’ll miss some things yet I know they’ll be plenty I won’t at the same time. I’ll find out when I’m back home. I arrived tired and exhausted yet happy that I finally made it to Kolkata. The poor weather conditions in the Andamans caused the cancellation of the government ferries and it meant a 3am ferry ride that took four and a half hours to get us to Port Blair. Just my luck that I’d missed my flight in the morning to Kolkata from Port Blair and so, with the help of my travel agent, quickly organised for two more flights – one to Chennai from Port Blair and then another one to Kolkata once I’d got to Chennai. Fortunately when I got to Kolkata, getting to the hotel wasn’t as bad as it had been in Chennai and I arrived in a much better mood despite the constant travel. After the seclusion of the Andaman Islands, Kolkata came as a bit of a shock to the system. Every person who knew I was heading to Kolkata said exactly the same thing, “there’s too many people in Kolkata”. Undoubtedly they were right. The entire city heaves with the sheer number of people walking the streets and driving around – the traffic still seems to flow unlike Bangalore though at the price of constant loud honking on the part of most motorists. As a pedestrian, you almost want to walk around with ear plugs to soften some of the noise. I stayed quite close to Park Street, a place well known for its lively atmosphere and characters. It’s also well known by locals for having lots of tourists as the number of touts and hawkers demonstrate. As I walked around the New Market area just north of Park Street, easily eight or ten people in a period of half an hour approached me either trying to sell me “good hashish” or trying to persuade me to just look at their store. They normally come up to you and ask where are you from, and what are you doing, trying to build that rapport before trying to go into the hard sell. Others just confront you and ask you, “You want a good time? I have good stuff”. It’s frustrating when you’re just trying to get around from one place to another without being constantly distracted. Kolkata is home to Mother Theresa and although I couldn’t find the place where she started her work, just down from Park Street is a memorial to the patron saint of this city. Other things worth doing include visiting the majestic grounds of the Victoria Memorial, the fairly large Indian museum, the Birla Planetarium (if you can get tickets), and a ride over the Howrah bridge – apparently one of the busiest bridges in the world connecting Kolkata to its sister city, Howrah. Take a seat in the ever busy Flury’s offering delightful offerings ranging from pastries and freshly made continental food. Kolkata is also well known as the home to the first Indo-Chinese food (think Chinese food adapted to local Indian tastes) and plenty of Chinese restaurants offer this fusion food all over India now. Find the pictures from my trip here. I’d originally planned to head to Goa for both Christmas and New Year and a couple of co-workers said don’t bother heading there as it’ll be overcrowded, overpriced and it’s not that great. Asking them for alternatives, two places came up – the Lakshadweep islands off the west coast of India and the Andaman and Nicobar Islands off the east coast. Calling and emailing a few places, Lakshadweep appeared fully booked and so I ended up organising for a ten day stay in the Andamans instead. Organised through Andaman Holidays, I had an amazing stay on the barely touched Havelock Island snorkelling, swimming, resting on a beach and scuba diving. All that sun also guaranteed plenty of relaxation and a generous tan by the end of it. The island is pretty good for meeting nice people as well as it’s a pretty chilled atmosphere and met some people from India, and many others from all different parts of the world. Eating at some of the more local places also mean striking up conversations with some locals who have some pretty interesting lives living on the island. Even though it’s peak season for the crystal clear, sapphire blue waters of the Andaman Islands, Havelock at most had probably two hundred visitors. Given that there’s fifteen or twenty resorts and eco villas littered around the shoreline of the island guaranteed the beaches stay ridiculously empty for the most part. At some points, it almost feels like you’re on a deserted tropical island somewhere. I thought I’d kill two birds with the same stone and ended up completing the PADI open water scuba diving course. Being qualified opens up new opportunities to do different sorts of diving around the world and doing training in the Andamans means seeing some of the best underwater wildlife in the world. A friendly Goan called Vikas who’d been teaching diving for the last six years in Goa ran our course, and kept telling us the visibility in the Andamans is amongst the best in the world – it’s clear, clean waters the perfect place to learn and to go diving. Compared to Goa where it’s limited to about a metre, we could easily see ten metres at a stretch on many of our dives. Diving at South Button Island also means fantastically clear water – even at the surface snorkelling, you’ll easy spot all the wildlife at the bottom that’s ten or twelve metres away. Unfortunately I have no photos of the amazing underwater world we uncovered on our dives. I can say we saw amazing beds of brightly coloured corals teeming with even more brightly coloured tropical fish and I can’t recommend it highly enough for people. We spotted all sorts of fish, my knowledge of their names quickly exhausted as I try to take them all in. My favourites definitely remain the tiny, tiny clown fish (think of Nemo) playing in the anemones. It’s amazing how close you can hover over them and watch them play. Entry into the Andaman and Nicobar Islands is via Port Blair – a fairly industrialised and not very scenic island amongst the Andamans. It has plenty of historical significance as it’s home to Cellular Jail, the place where the British kept all the Indian freedom fighters during the time for independence. 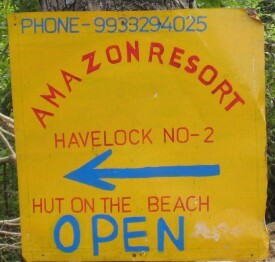 The easiest way to get to Havelock is via the government ferries that depart two or three times a day from Port Blair. Unfortunately the visit of India’s president to Havelock and stormy waters forcibly meant taking alternative transportation (i.e. hire a boat) to keep to the schedule. It was pretty exciting to have the President of India visiting Havelock island though it meant that you effectively couldn’t go anywhere by the road and also screwed up many people who’d planned to arrive or leave the island the day of her visit. On the day of her visit, the sound of many helicopters arriving and circling also broke up the quiet sounds of the waves lapping on the sand though it was just for half a day in the end. Time magazine also voted Havelock’s Radah Nagar Beach (also known locally as Beach #7) as Asia’s best beach. The beach, shaped in a moon-crescent fashion is undoubtedly one of the best swimming beaches I’d ever swum in. Its water remains consistently clear even with the tiny breaking waves and unlike many of the other coral-ridden beaches on the other side of the island is entirely made up of tiny, soft granules of sand. Barefoot resort is the only resort on this side of the island and is also home to two now-retired elephants that give rides and also go swimming in the ocean from time to time. If you visit the Andamans, I’d highly recommend indulging in the fresh seafood available – it’s a staple food on the island and many of the restaurants in the various resorts prepare them in many different ways. The Burmese style-sauce of the Wild Orchid’s restaurant (and it’s sister one at the Emerald Gecko) is definitely worth trying one night, as is the Tandoor version from one of the other places. Pristine Beach Resort, home to the Poseidon restaurant also offers very fresh crab (you can pick one from the bucket out front). Find the pictures from the rest of my trip here. The day started off very well – the thought that the driver I’d hired for the day trip to Mahabalipuram wouldn’t find where I was staying evaporated as soon as I saw the taxi parked downstairs. The driver asked me if I was the ‘Pitersk’ they’d written down over the phone after about 15 minutes trying to spell my name. “Yes, that’s me,” I resigned myself to. The driver, whose name I understood as Ram Krishna, spoke enough broken English to get through the entire day. Our first major conversation, like many of the ones to follow throughout the day began with money – this time, 700 rupees to fill up the tank for the day. He honked at a petrol attendant for some attention and diesel and soon we were on our way. Every so often, he would look up in the mirror and start explaining some things. I find out that the traffic is very bad in Chennai, there’s always construction (pointing to another fly over to emphasis the point) and apparently plenty of people in Chennai. I think quietly to myself that it’s definitely not as bad as Bangalore. I also wonder if the overpasses they continue to build really work, or simply distract from the bigger problem of too many people and not enough public transport. My answer doesn’t come and we pass yet another flyover under construction. Our first stop of the day is Elliot’s Beach for the world famous Laksmi Hindu temple. This temple is pretty massive, and totally dedicated to the goddess of wealth. Unsurprisingly, this temple and the area around it took significant damage during the tsunami – the shanty shacks around it reassembled quickly, and the temple slowly following behind. It’s free entry this time though no cameras allowed. It’s one of the biggest temples I’ve entered, and we’re blessed in at least five separate places with a flower, some spiritual water, marks to the forehead and a number of clasps of a metallic bowl to the head. You ascend and descend around the temple as you pass all the blessings and at one point see a fantastic view of the surrounding area. We drive further down the coast and although the roads appeared busy, I think that honestly they’re one of the best I’d been driven on so far. Definitely miles away from the nightmare bus ride to Ooty. We continue driving through passing through a toll booth – something that I think is universally complained about, with the driver fully getting into the cursing of the excess charges. I pay the INR50 toll for return to Mahabalipuram. My driver stops for a brief meal and we finally enter Mahabalipuram (and another entry fee – this time I think only INR20). We head for the first sights, this one free and are a series of intricately made temples and features carved directly out of the rock in the hills. Strangely enough, the typical touts (selling jewellery, or asking for money) stay outside of the gate. Inside them instead, you’ll find a different breed of tout – these ones actually speaking English very well and keen to give you a guided tour for either a fee or a visit to their store later. I decline several of them, and manage to pick one up on the way who takes me around telling me all about it. The best bit here is really the Krishna’s Butter Ball that looks as if it would topple and crush a whole swag of people, yet remains stuck to the wallface. I have enough as it’s getting extremely hot, and the number of tourists at some of the points is overwhelmingly numerous. I find my driver (by the number plate of the car) and we make our way to the next sight, another World Heritage Monument, the Five Rathas. A series of carvings, all out of stone stand out in the middle of an enclosed area and I sit down to watch the large groups of families and a handful of tourists descend on each temple for a show. I find the taxi driver once again and we make our way to the final destination, and probably my most favourite of the three, the Shore Temple. Parking in the area is ridiculously busy, not only because of the temple, but because of the beach that lies adjacent. I walk down there first – a narrow alley bustling with stores selling random beach items and a couple of food and drink places. I stop for some chai to ironically escape the heat for a bit. Arriving at a beach is one thing to really look out for. Stores line the sand from one point to another, whilst people jump into the water – sometimes fully clothed (the women in saris, or men in singlets and trousers). Others strip to their underpants before taking to the water. I walk back down the alleyway, and make my way for the entrance of the Shore Temple. Foolishly I end up paying the tourist fee once again (you can use the same ticket for the Five Rathas and the Shore Temple) and hopes it pays for some good maintenance. I’ve seen temples by the shore before, and the unique different here is that it’s completely carved out of a rock (or perhaps series of rocks). There’s something magical standing in amongst its pillars facing the ocean on almost all sides. I tire after the temple, and it’s getting late in the day, so we make our way back to Chennai. A quick nap ensures a relatively speedy ride home.